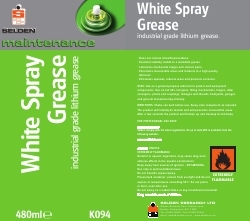 Use as a general purpose lubricant to protect and waterproof components. Use on tail lifts, tail gates, lifting mechanisms, hinges, roller conveyors, pivots and couplings, linkages and threads, boatyards, garages and general manufacturing industry. Shake can well before use. Spray onto component as required. The product will initially be mobile and will penetrate inaccessible areas. After a few seconds the product will thicken up and develop its full body. Composition High quality lithium grease in a solvent base.